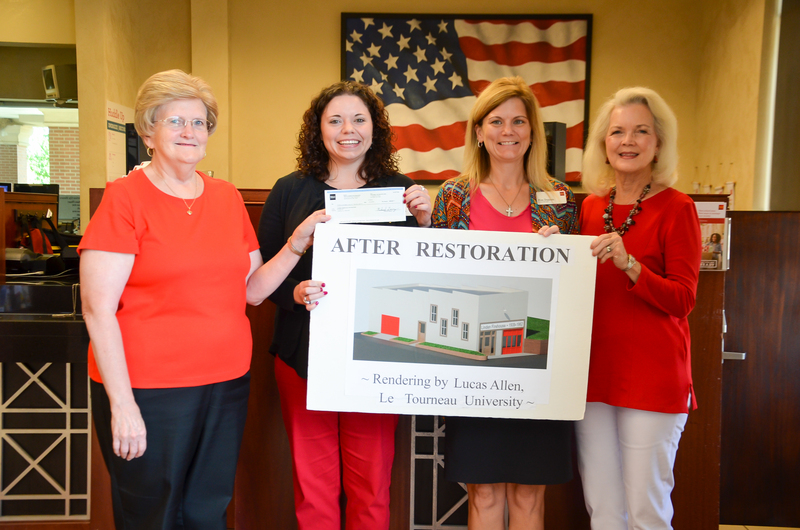 Kaoline Parsons, Texarkana Regional Banking District Manager (left) and Kimberly Duncan, Atlanta Branch Manager (second from right) for Wells Fargo Bank presented a $500 donation to the Linden Heritage Foundation’s Firehouse Rescue Fund on August 5, 2016. Jana C. Bounds (left) and Charlotte Wells (right) accepted the check on behalf of the Linden Heritage Foundation. Kimberly is also a proud member of the Foundation. The Linden Heritage Foundation is working toward full restoration of the 1939 Linden Firehouse, a New Deal Era civic building that has been officially determined eligible to the National Register of Historic Places. At the time this structure was completed to serve the people of Linden, the City population was 900. The volunteer firemen had a sleeping room upstairs and the city owned a single fire engine – first purchased in 1935 and kept in a rented facility until the Firehouse could be completed in early 1939. The people of Linden and members of the Linden Heritage Foundation greatly appreciate Wells Fargo and all the other Firehouse Fund donors who readily support projects that make our towns more livable and our local heritage more palpable. Photograph courtesy of Jo Anna Duncan’s Front Porch Treasures Studio on Facebook at https://www.facebook.com/FrontPorchTreasuresStudio. < Previous Happy Anniversary – The Linden Heritage Foundation is one-year old!